If you were under the impression that a pair of large wheels supporting a seat under your bum was the only petrol-free way to get around a city, you've clearly forgotten about the innovative Halfbike first introduced last year. But that's OK, because there's now a new and improved version for urban dwellers that promises the same workout in a sleeker design. There's actually nothing wrong with a traditional two-wheeled bike. At least until you try to squeeze it into an lift, onto a train carriage, or take it almost anywhere in an urban setting other than the street. 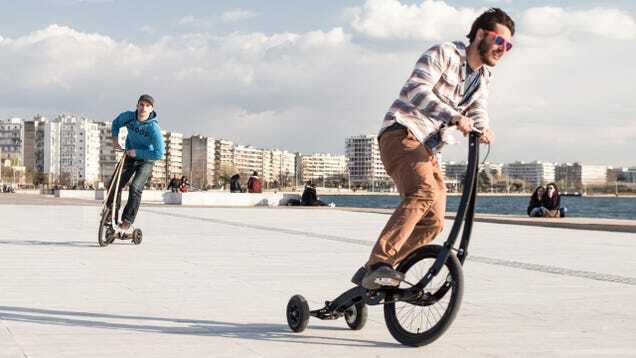 To make it easier to transport and store, the Halfbike II uses a smaller front wheel than most bikes have, and trades the back wheel for a pair of tiny tires giving it the appearance of a large tricycle. However, the Halfbike II is still ridden like a traditional bicycle using pedals closer to its mid-section. The big difference is that there's no seat, so you have to stand the entire time. It results in a smaller footprint for the bike making it easier to squeeze through traffic and crowds while riding, and thanks to a folding handle, it's even easier to take with you on public transportation. The only trade-off of the Halfbike II's unique design is that cycling becomes a slightly more rigorous workout. But that's the same reason people opt for a standing desk at work, right? So whether or not being harder to ride is viewed as a pro or a con is up to each individual rider.